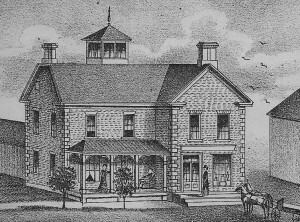 The Historical Atlas of Carleton County, published in 1879, features drawings of the homes of prominent county residents including this McBean St. residence of William Butler. Mr. Butler was a long time Richmond Postmaster (1857-1902), merchant, tradesman, and village leader. His home was located in the wing running parallel to the street while his store was in the section to the right with its door in the front facing gable. This configuration made it ideal for future owners, Dr. F.F. Kemp and Dr. R. Fitz-Gerald to combine their homes and offices. William Butler’s name first appears in the Canada Directory of 1851. At that time he is listed as a tanner and currier, lot 17 Maitland St. (that would be on the north bank of the Jock River). The Census of 1851 shows that he is a 24 year old married man. He became postmaster in 1857 and initially distributed the mail from a building on the north side of Strachan St. just east of Lennox St. (see the map to the left). 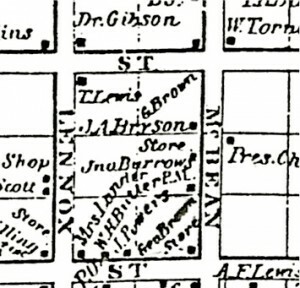 Before 1850, the village clustered along the Jock River but as regional roads improved, a new commercial area developed along McBean closer to Perth St. The post office was centered at this new location until 1902. Mr. Butler was not only a tradesman & merchant. The 1871 Province of Ontario Directory lists him as agent for The Montreal Telegraph Co. and his daughter Miss Anna Maria Butler as a telegraph operator. William Butler was active in village life. A captain in the militia, he was a school board trustee in the 1860’s and 1870’s, council member for many years, and reeve of the village (1873-4). In this period of village life, families frequently raised not only their own children but also those of others. A great-granddaughter, Mildred McCoy, related in a speech to the St. John’s congregation in 1988, how her ancestor, like many other community leaders, looked after not only his own four children but also a niece. 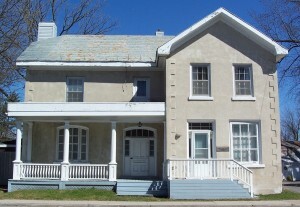 This building was also the residence and office of Dr. F.F. Kemp, a dentist in the village from 1923-66. In 1966, Dr. R. Fitz-Gerald purchased the property and carried on his medical practice from this location. Like Dr. Kemp, Dr. Fitz-Gerald also lived in the building. Built in the Classical tradition, some of the original features have been removed or are currently hidden by the stucco finish. The cupola, store chimney and original veranda are no more, and the brick work is covered. However, one can see the outline of the quoins on the corners and the stately essence of building has been retained. The main door has a transom with a slight arch which is replicated in the top of the window to its left. The doorway is enhanced by sidelights. The store/office side of the building is much plainer. Curry, John. Richmond on the Jock. Stittsville: Stittsville News, 1993. Illustrated Historical Atlas of the County of Carleton including Ottawa 1879. H. Belden & Company. reprinted Oshawa ON: Wilson’s Publishing Co., 1997. Walling, H.F. “Map of the County of Carleton, Canada West”. Prescott: 1863. This entry was posted in industry, Locations, Personalities and tagged Industry, post office, store. Bookmark the permalink.